In truth, I've not exactly ignored Sundin in this space. We've touched on his possible Hall-of-Fame candidacy, for example. And I've also posted about something that struck me as a similarity between he and his countryman, another Leaf legend, Borje Salming. But I haven't chatted about Mats a lot here. It so happens that I did have a professional relationship with some individuals I respect a great deal within the Leaf organization at the time that Sundin played in Toronto, but anything I might have “heard” with regard to Mats will stay private, as it should. I will only say this: nothing that I might have heard would have, in any way, dissuaded me from thinking that that he was a wonderful player—and a fine leader and person. It’s not easy being the captain of the Leafs, and not easy to handle the many and varied demands that come with the job. Forget the always high on-ice expectations—what you have to do off the ice is exhausting and very stressful. 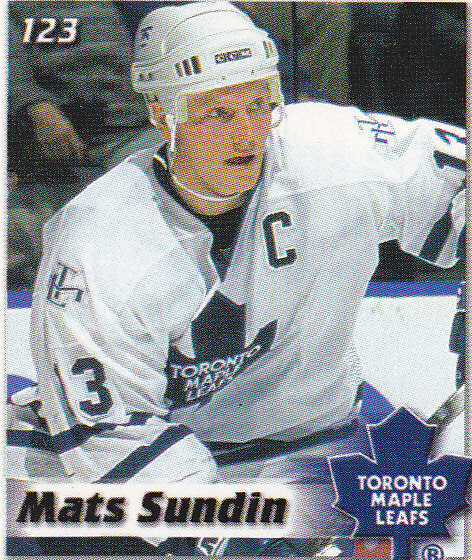 But if we’re going to talk about Mats Sundin, I will say that he fits well into a long and proud line of Leaf captains. He brought a power game combined with finesse and yes, grace. You don’t see that every day, and we haven’t seen it, in all honesty, very often in Toronto. 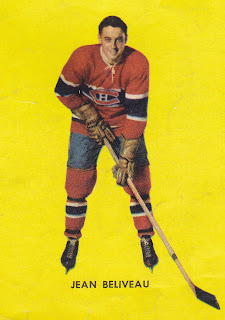 Frank Mahovlich had it, but very few others have. Sundin, in many ways (but without the 10 or so Stanley Cups) was our Jean Beliveau (left). Elegant, but with an inner toughness that drove them to be, as the saying goes, the best they could be. Darryl Sittler and Wendel Clark both were powerful guys and had elite skill, for sure. But I’m not quite comfortable saying those two ex-Leaf greats were graceful or elegant. (I’m guessing Wendel would laugh at that suggestion…) Dave Keon was the ultimate in skill and grace as a long-time Leaf and captain, but obviously not a power guy, nor did he have a large frame for his era, like Beliveau. George Armstrong (Leaf captain just before Keon, starting in the late 1950s) was a tremendous leader but a choppy skater who had a weak shot. He succeeded—and led—through determination, smarts, guts and guile. No, Sundin was a rarity. And we’re not so far removed from him playing here that we are kind of over-glorifying his skills or his impact. He was a Lindros without the mean streak who lasted a lot longer and, ultimately, was far more productive (though who knows how high the ceiling would have been for a healthy Lindros). I would never argue that Sundin was Mark Messier, who was a different kind of player and a very different kind of leader. But Sundin was very, very tough in his own way. He played hurt. He bled for this team, quite literally. While not a guy who had to fight (I say that in a complimentary way), he was not exactly a guy you could shove around. Was he a perfect player, or a peerless leader? Of course not. Oh, we can mention the awful playoff elimination night in New Jersey a decade or so ago, when the Leafs mustered, what was it, 6 shots in an entire game against the Devils? A critic would say, what kind of “leader” allows that kind of effort to happen in a game like that? But that was not all on Mats. That was a team that had hit the wall, and just didn't have enough to fight through the Devils one more time, one more game. Some will not forgive him for “how” he left the Leafs—that is, “refusing” Fletcher’s request to trade him. Personally., and I am probably in the minority, while I understand the fan sentiment, I don’t know exactly what it was Sundin’s job to help the Leafs re-build. Sports is ultimately me against you, and once my boss tells me he/she doesn’t want me around anymore, for whatever reason, my interest in “helping” my old employer drops to zero, just like their interest in keeping me around. That Sundin, or Kaberle, for that matter, wanted to retire in Toronto as a Leaf, was, for me as a long-time Leaf guy, what I want to be the case. I don’t want guys who want out of town as soon as things turn tough. Sundin may not realize it himself, or acknowledge it, but he played the best hockey of his life under Pat Quinn. He was a really nice player before Quinn and still a fine player afterwards, but I would argue that all those years, when Quinn was refusing to play him 23 or so minutes a night (when Sundin wanted to play more), were Sundin’s very best in a long and distinguished career. He was fresh come playoff time and delivered more often than not. While Mats often seemed to have to carry his line many years, he did play well with Gary Roberts for a time and they were tough to contend with. Mats generally made the guys around him better, but didn’t play with another true “superstar”, I think it’s fair to say, (like Orr and Esposito, Lafleur and Shutt, Park and Ratelle, Potvin and Trottier, Gretzky/Messier and Coffey, etc…) in Toronto—someone who would have perhaps made him even more of an impact player and dangerous presence on the ice. Anyway, my “memories” of Mats will no doubt be sparse and nowhere near as touching or in-depth as the many fine hockey writers who “covered” the Leafs during those Sundin years, or Leaf fans for whom Sundin was their “favorite”, as say, Keon was for me when I was much younger. All I can really say is this: when I look at all the leaders I have witnessed in a Leaf uniform, Sundin is “up there” in terms of the respect I have for him as a player—and for the way he conducted himself publicly in a tough, tough market. We have to remember, there were perhaps some “dressing room” issues around players like Corson (who left the team suddenly at one point), Domi’s ill-timed hit on Niedermayer in the playoffs (and resultant suspension) and a variety of things that he no doubt handled deftly—and quietly—behind the scenes during some fairly tumultuous years when the team, as Curtis Joseph once said, was a pretty “combustible” group. I have probably mentioned this before, but you know what I remember most about Sundin, or perhaps I should say, what my real enduring memory of him as a Leaf will be? It is simply this: whenever the Leafs scored a big goal, whether it was him that netted the marker or the least-known of his teammates, he smiled and embraced his teammates in a way I just can’t forget. I realize everyone celebrates after a key goal, and players smile, and understandably so, when they have success. They put a lot of work into achieving what is sometimes fleeting recognition and success. But for me, an individual that can be as—or even more—happy for a teammate than he is for himself at those special times is a rare individual. (Hell, it’s tough for anyone in sports, or anyone on life for that matter, to truly feel happy for someone else when that other person succeeds. Envy, jealousy and competitiveness so often creep into the equation. I just always sensed that, through those years, if Quinn was the sometimes demanding father of the brood, Sundin was, in his own way, the big brother who helped to achieved even more by supporting, encouraging and nurturing his less skilled teammates He was the perfect foil for and complement to his head coach through the truly “good years” in the late ‘90s and early 2000s. We won a lot of games in those years, and a lot of playoff games, too. There were a lot of flags and a lot of horns honking, between 1999 and 2004—and a lot of smiles all-around. Sundin was a huge part of it. It’s too bad, I think sometimes we don’t appreciate a guy maybe as much as we should have, until he has retired. How good would Mats look in his prime as the number-one center for this young crew? So it’s happening a little earlier than maybe I was expecting, but by all means raise the jersey high. We all need a Leaf high once in a while—and we’re due. Great piece, Michael, and well said. Mats was a terrific Leaf, great leader, and a great captain. I've always said Wendel is my all-time fav Leaf, but Mats is right up there. I do recall that smile and his embrace of linemates after a goal - that was something. I'm with you in appreciating his loyalty at the trade deadline. And to the people who still insist that Mats hurt their rebuilding, I ask, how much could the Leafs really have got back? Deadline "rental" players traditionally do not yield high returns for the selling team. By all means correct me if I'm wrong, but history will back this up, if one analyzes deadline deals such as Bourque, Gretzky, Brad Richards, etc. They either returned "small pieces" rather than "The Piece" that completes the puzzle, or late draft picks. (Burke committed highway robbery with the Kaberle deal, but that's an exception and we're still waiting to see how that plays out). The point I'm making is that while trading Mats may have provided a few small pieces, the organization was not in a position where any return would be significant in making them a playoff team. And then the same detractors who wanted Mats to leave would be saying the Leafs should've signed him to an extension. So for all that's worth, I'm glad Mats stayed for that season. For all his efforts on and off the ice, he's one tremendous guy I can be proud of. My only disappointment is that he didn't retire a Leaf. But all will be set aside on Saturday, and I will join in saluting a classy captain, and a great Leaf. I've been looking forward to this post from you all week, and you didn't disappoint. Kind of you to say that, Curt S.....Thank you. I was thinking last night, after the ceremonies are over and we're ready to drop the puck, wouldn't it be great if Mats showed up on the bench and they announced we'd signed him to a one-day contract? One last run at being the power 1st line center we need so bad. The crowd would go mad. Sundin was a good - not great player. He was durable and a decent leader who led by example. However, he did not take the team to a Championship. Thus, he is not in the same league as Apps, Kennedy, & Armstrong. He is not even in the same league as Sittler, who had big moments and delivered in big games in way Sundin never did. I am sorry to disrupt the love-in, but give me the Chief every time.